Do hand creams stop your skin from regenerating? Julia from Germany asks…I have very dry skin so I use hand cream a lot. I read an article that said if you use too much hand cream the skin on your hands can not regenerate properly anymore because it becomes dependent on the hand cream. Is this true? As we just said, when you remove the upper, dead layer of skin it triggers the production of more, new skin cells. The opposite is true to some extent – when you hydrate the upper layers of skin you actually slow down the sloughing off process by a little bit. That means there’s less of a call for new skin cells to be produced. So, in that sense, lotions can slow down skin regeneration. But, slightly slowing down the skin regeneration is not the same as stopping it all together! Is quinoa the next super-food beauty ingredient? Leslie says…Quinoa is everywhere! Since I started eating Panera’s Quinoa bowl I notice it popping up in beauty products all over. I know it’s good to eat but does it have any beauty benefits? Quinoa is one of the “ancient grains” that are popular right now. It’s rich in fatty acids, minerals, antioxidants, and proteins and there’s no doubt that it can be part of a healthy diet. But does it do anything when applied topically? That’s another question. 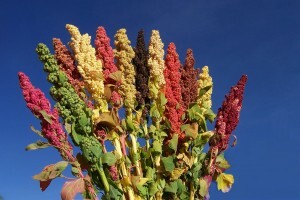 First, we have to look at the versions of quinoa that are available for use in cosmetics because there are two different kinds and they don’t deliver the same beauty benefits. There’s hydrolyzed quinoa and quinoa seed extract. The first, “hydrolyzed quinoa”, is the form used in most hair and skin-care products and it only contains the protein from the grain and those proteins have been chopped up into tiny bits to make them water soluble. There are lots of kinds of hydrolyzed proteins and they’re typically used because in cosmetics they’re film formers which means they can help moisturize skin and strengthen your hair. These types of proteins provide some benefit from a leave on product but they don’t do much of anything from a rinse out product because they’re not chemically modified to stick to skin or hair. They just rinse down the drain. An example of a product that uses this version is Paul Mitchell’s Ultimate Color Repair Shampoo. According to Paul’s website quinoa was “Discovered by the Incas thousands of years ago” and it…is “rich in amino acids that penetrate into the hair and bond like a magnet, creating a protective shield.” That’s not exactly true but it does make for a good story. Aqua (Water, Eau), Sodium Cocoyl Isethionate, Cocamidopropyl Betaine, Disodium Laureth Sulfosuccinate, Sodium Lauroyl Sarcosinate, Sodium Lauryl Sulfoacetate, Cyclopentasiloxane, Dimethiconol, Polyquaternium-7, Hydrolyzed Quinoa, Trimethylsiloxyamodimethicone, C11-15 Pareth-7, C12-16 Pareth-9, Glycerin, Trideceth-12, Hydrolyzed Wheat Protein PG-Propyl Silanetriol, Butylene Glycol, Helianthus Annuus (Sunflower) Seed Extract, Cinnamidopropyltrimonium Chloride, Saccharum Officinarum (Sugar Cane) Extract, Citrus Limon (Lemon) Peel Extract, Niacinamide, Calcium Pantothenate, Sodium Ascorbyl Phosphate, Tocopheryl Acetate, Pyridoxine HCI, Maltodextrin, Silica, Sodium Starch Octenylsuccinate, Panthenol, Aminopropyl Phenyl Trimethicone, Glycol Distearate, PEG-150 Pentaerythrityl Tetrastearate, PEG-6 Caprylic/Capric Glycerides, Polyquaternium-10, Trisodium Ethylenediamine Disuccinate, Cassia Hydroxypropyltrimonium Chloride, Phenoxyethanol, Phenethyl Alcohol, Caprylyl Glycol, Ethylhexylglycerin, Propanediol, Tris (Tetramethylhydroxypiperidinol) Citrate, Ethanol, Citric Acid, Lactic Acid, Malic Acid, CI 19140 (Yellow 5), CI 16035 (Red 40), Parfum (Fragrance), Benzyl Salicyla, Hexyl Cinnamal. The second version of this ancient grain is “quinoa extract.” The extract comes the seed oil which makes it a better moisturizer and potentially a scavenger of free radicals. An example of a product that uses this version is Laneige Water Bank Eye Gel which supposedly “penetrate the gentle eye area, preventing dryness and protecting from external aggressors.” My favorite claim for this product is that also contains “Miniscule particles of hydro ionized mineral water.” That’s much better than those big chunky pieces of regular water. Water, Glycerin, Butylene Glycol, Cyclopentasiloxane, Cyclohexasiloxane Chenopodium Quinoa Seed Extract, Magnesium Sulfate, Zinc Sulfate, Manganese Sulfate, Calcium Chloride, Ascorbyl Glucoside, Vaccinium Myrtillus Fruit/Leaf Extract, Saccharum Officinarum (Sugar Cane) Extract, Citrus Medica Limonum (Lemon) Fruit Extract, Citrus Aurantium Dulcis (Orange) Fruit Extract, Acer Saccharum (Sugar Maple) Extract, Hydroxyethyl Acrylate/Sodium Acryloyldimethyl Taurate Copolymer, Dimethicone Crosspolymer, Polyacrylate-13, Pentaerythrityl Tetraethylhexanoate, Hydrogenated Vegetable Oil, Pca Dimethicone, Peg-100 Stearate, Cyclomethicone, Glyceryl Stearate, Polyisobutene, Dimethiconol, Dimethicone, Phenyl Trimethicone, Ethylhexylglycerin, Polysorbate 20, Acrylates/C10-30 Alkyl Acrylate Crosspolymer, Tromethamine, Disodium Edta, Fragrance. So the bottom line on quinoa is that it probably doesn’t really provide that much extra benefit and it’s certainly not worth spending a lot more money on. However, of the two forms the seed extract is probably the most effective so look for the words “quinoa extract” on the label. Can this Lithuanian skin cream cure cold sores? Ramune from Lithuania asks…I am from Europe, Lithuania to be exact, and here we have a local cosmetic company O.D.A (in Lithuanian it means “skin”). Recently they released a new product – a skin balm. It supposed to cure wounds, regenerate skin and it has a strong anti-inflammatory effect. I’ve tried it on small cracks on my hands and it kind of helped. I also tried to cure a runny nose with it and the next day it was gone. It’s also suppose to help to stop cold sore spots becoming bigger and to cure pimples on your face too. Could you please review ingredients and explain the magic? I looked at this product and found that it contains triethylene glycol, ethycarbitol, lanthanum oxide, and glycerol. The active ingredient appears to be the lanthanum oxide which, according to at least one source, can suppress bacteria and viruses. I’m guessing that’s why they claim it works on pimples and cold sores (as well as the common cold virus that can cause a runny nose.) I think the other ingredients are just the delivery vehicle. The article I read says there’s not much safety data for this ingredient (at least in nanoparticle form) which makes me a little nervous. I don’t know about Lithuania, but I expect that Lanthanum oxide would NOT be allowed as an ingredient here in the US. Is Moringa oil the new Argan oil? Sheila Marie says…My Auntie bought me Infusium 23 Miracle Therapy shampoo and conditioner with Moringa Oil. I know that you guys have talked about argan oil, rose hip oil, sesame seed oil, coconut oil, etc. But can you talk about Moringa oil and the perceived benefits that it has? Moringa oil comes from the seeds of the Moringa oleifera, also known as the Drumstick tree. It’s hard to keep track of all these oils – it seems like every couple of months someone is touting the latest and greatest. I suspect this is mostly a case of companies trying to make their products sound more exotic because when you look at the composition of some of these rare tropical oils they’re not all that different than some of the more conventional ones. Argan oil aka Moroccan oil, just to compare to another tropical oil, is has about half as much oleic but it has a good slug of linoleic which is an EFA that’s good for skin. It also contains palmitic. So, all these oils will moisturize skin to some extent but their chemical composition does vary from oil to oil. Because Moringa is so rich in oleic I’d expect this material to behave like olive oil (which does not penetrate hair like coconut oil does.) What does that mean for this Infusium product that Sheila Marie asked about? Not much! Why do I say that? First, it’s not the primary active ingredient (both the shampoo and conditioner appear to be typical P&G formulas. Did you know Infusium is a P&G product?) Second, these are both rinse out products so an oil like this won’t really deposit on the hair. And third, I suspect that Infusium only contains a token amount of the material. If you look at the ingredient list you’ll see it’s after the stearalkonium chloride (which is typically used at about .5& to 3%) and before panthenol and propyl paraben (which are probably well below 1%). If I had to guess I’d say there’s a little less than 1% in the formula. Are 90% of nail product ingredients untested? Sarah in Forum asks…did you guys ever talk about the video that was going around last year that nail salon workers are exposed to a lot of dangerous fumes and that 90% of nail product chemicals haven’t been evaluated for safety? We’ve talked many times about the idea of “the dose makes the poison” and it’s tragic that nail salon workers may be exposed to dangerous levels of chemicals. However, it’s not true that 90% of nail product ingredients haven’t been evaluated for safety. You can prove this to yourself: Just look the ingredient list for any nail polish and then pick a few of those ingredients and Google their names with “safety assessment.” You’ll find safety data. Is DIY glow in the dark nail polish safe? Anonymous asks…Is it safe to make your own glow-in-the-dark nail polish by mixing regular nail polish with the chemicals from a glow stick? I found this on wikihow. It always amazes me that people are so afraid that Big Cosmetics are selling unsafe, toxic products but if they’re doing it themselves at home, they’ll throw together what ever household or industrial chemicals they want and slather it all over their bodies and it’s perfectly fine. Remember a few months ago we talked about using fabric softener on hair or skin, now this nail polish hack. Come on! Here’s why this is a bad idea: A glow stick contains a small inner tube of hydrogen peroxide suspended in a chemical known as diphenyl oxalate. When you bend the stick the inner tube cracks open allowing the two chemicals to mix. The resulting reaction forms an unstable compound that quickly breaks down to release energy which is absorbed by the pigments in the stick causing them to glow. None of these chemicals (except maybe the hydrogen peroxide) are intended to meet the same safety testing requirements as those used in cosmetics. This is especially concerning since you may inadvertently ingest some of these chemicals as you eat, touch your fingers to your mouth etc. Of course there is always the potential for allergic reactions on your skin as well. The bottom line is that this is NOT a good idea. NerdyDrummerGirl says… This is a beauty podcast with a major difference: they’re based on science instead of hype. It’s so refreshing to hear someone talk about the beauty industry in a way based on evidence instead of either fear or marketing. They aren’t trying to sell you any makeup, they just want to teach listeners how to think critically about the things they hear about beauty. I can’t read some of the beauty blogs I used to anymore because I can now see where they are just spreading hype. LinRP says…Smart, Informative, Hugely Useful and Fun. If you are tired of being a makeup skin-care-buying rube, you have come to the right place. The information in these podcasts and on their blog can save you hundreds of dollars. I tend to be leery with spending my money on P&G products and try to avoid doing so as possible but this is on moral-ethical grounds exclusively because of things the company monies will back in the form of advertising even as nearly all other such sponsorship has gotten pulled by companies who then follow up with a statement where they indicate they are aware of the concerns, have chosen to no longer be corporate sponsors, and are committed to this course of action indefinitely. ingredient list: mostly dreams, little bit of misleading to benefit from connection consumer makes to actual medical and science ‘buzz’; the rest: a mixture of ingredients that are common throughout the product market and a touch of this and that because of the purported positives + profits. Real benefits to use would be moisturized skin with maybe a light fragrance but nothing revolutionary on the anti-aging territory frontier. A few lines would have been sufficient. In this podcast you said Moringa oil is similar to olive oil and most of these exotic oils are more about marketing and they’re not that special or are similar to other oils, can you do a podcast comparing all these new exotic (plant) oils and tell us if any are actually different enough and more beneficial than more common oils? I want to know this both for skin and hair oils, since you seem to be using the word “most” and I want to know what the exceptions are, if any. For example you also said coconut oil penetrates hair and waterproofs it from the inside and most oils don’t, does this mean there are any others that do? I don’t want ANYTHING synthetic or film forming (despite you thinking they’re fine) and am looking for products (such as plant oils) that both penetrate and heal skin. For example I’m also looking for something to heal hyperpigmentation and want to know how effective sea buckthorn oil is (compared to other plant oils) before changing my pillowcase to black so it doesn’t get stained orange, because I’d rather not deal with that mess.